Q: According to reports, the DPRK and the ROK have agreed to hold a summit meeting at the end of April. What's China's comment on this? China said that it will play its part in resolving the Korean Peninsula issue, so what effort will China make in this regard? A: For a long time, China has stood for and actively promoted the settlement of the Korean Peninsula issue by all relevant parties through dialogue and consultation and maintained that all relevant parties should enhance understanding and build mutual trust through contact. We approve of and support the series of communication and interactions between the DPRK and the ROK during the Pyeongchang Winter Olympic Games and are pleased to see the positive outcomes achieved by the two sides. We believe that this serves the common interests of all the people on the Peninsula as well as relevant parties and is also conducive to regional peace and stability. We hope that the DPRK and the ROK will earnestly act on relevant consensus and continue to advance the process of reconciliation and cooperation. Meanwhile, we hope that all relevant parties will seize the current opportunity and work for the shared goal to advance the process of denuclearizing the Peninsula and politically resolving the Korean Peninsula issue. China stands ready to play its part to this end. Q: According to reports, yesterday, the commander of the United States Africa Command said that there will be significant consequences if China takes over a key port in Djibouti where China, the US and some other countries have military facilities. What is your response? A: I am not aware of the specific situation mentioned by you. China always conducts cooperation with Africa with an open and inclusive attitude, which does not direct at or exclude any third party. We hope that the US can view China's development and China-Africa cooperation in an objective and unbiased manner. Follow-up: White House National Economic Council Director Gary Cohn has just announced his resignation, most likely because of his opposition to President Trump's plan to impose tariffs on steel and aluminum products. Is China concerned at all that his leaving the White House may impact the White House's trade policy towards China? A: The personnel changes in the United States belong to its domestic affairs. You should be quite clear about our position on this. As to the issue of US imposing tariffs on the imported steel and aluminum products mentioned by you, my colleagues from the Ministry of Foreign Affairs and Ministry of Commerce have made clear our stance. Q: According to reports, Sri Lankan President Maithripala Sirisena on March 6 signed a gazette notification declaring a week-long nationwide state of emergency in response to Sinhalese-Muslim riots in several parts of the country. What is your comment on this? A: We have noted relevant reports. This belongs to Sri Lanka's internal affairs. 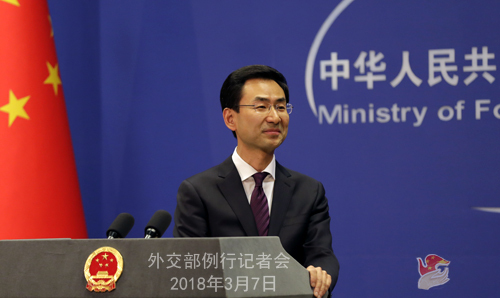 China believes that the Sri Lankan government and its people are capable of handling the current situation, and upholding Sri Lanka's social stability and ethnic solidarity. We also hope that Sri Lanka will take concrete measures to protect the security of Chinese citizens in Sri Lanka. Q: According to reports, US Secretary of State Rex Tillerson said on March 6 that Chinese investment has the potential to address Africa's infrastructure gap, but encourages its dependency, leads to mounting debt, undermines its sovereignty and endangers its long-term independent and sustainable economic growth through vague contracts, predatory loans and corrupt trade. What is your comment on this? A: I have already stated China's position while taking a similar question at yesterday's press conference and I am not going to repeat it. I would like to point out that supporting Africa in realizing peace, stability and development serves the common interests and is also the shared responsibility of the international community. China welcomes the diversification of Africa's international partnerships and sincerely hopes that various parties of the international community can increase inputs in Africa. In particular, the developed countries should earnestly deliver on their commitment. Relevant countries should develop relations with Africa with a view to supporting Africa's peace and development and making positive contributions to its prosperity and revitalization, instead of making irresponsible remarks on African countries' efforts to pursue their own development and their ongoing cooperation with other countries. African countries and people know the best and are in the best position to say whether the China-Africa cooperation is good or not. I would like to add that as agreed by China and Africa, the Beijing Summit of the Forum on China-Africa Cooperation (FOCAC) will be held in September this year. At the moment, China and Africa are in close communication and coordination and making all-out efforts to prepare for the summit. We believe that the summit will surely achieve fruitful outcomes and inject strong impetus into the development of Africa and the China-Africa cooperation. Q: Can you tell us the main topics for the Summit of FOCAC to be held in September? A: As I said just now, China and Africa are in close communication and coordination for the preparation of the summit. We will brief you on the preparation, relevant agenda and specific arrangements of the summit in due course. Q: According to reports, the Center for Global Development, a Washington-based think tank recently issued a study, saying that the loans provided under China's Belt and Road Initiative will significantly elevate debt risks in some countries, including Pakistan, Montenegro and Djibouti. What is your comment on this? A: In principle, we usually do not make specific comments on the viewpoints of media, think tanks, experts and scholars. I would like to point out that the Belt and Road Initiative proposed by China aims to promote connectivity, advance international cooperation and achieve the common development of all relevant countries. Many participants of the Belt and Road cooperation are developing countries with underdeveloped economies, a huge gap in and a great demand for infrastructure construction. Following the principle of extensive consultation, joint contribution and shared benefits, the Belt and Road Initiative has provided these countries with new opportunities and possibilities for shoring up weak links, breaking the bottleneck, improving the livelihood and developing their economies. This is one of the important reasons why this initiative is welcomed by a large number of developing countries. When advancing the international cooperation on the Belt and Road Initiative, China always follows the market principles and common international practices and attaches importance to debt sustainability. In May last year, the Joint Communiqué of the Leaders Roundtable and the Belt and Road Financing Guiding Principle released at the Belt and Road Forum for International Cooperation underlined that the Belt and Road projects should give equal consideration to the sustainability of economy, society, finance, environment and debt. Since its inception five years ago, the Belt and Road Initiative has been echoed and endorsed by over 100 countries and international organizations. Now it has become the largest platform for international cooperation and the most welcomed international public good. If it really would bring about so many risks, as certain people said, then I believe it would have been impossible for this initiative to win widespread popularity and achieve so much progress. As to whether the Belt and Road Initiative is good and its projects can deliver tangible benefits, no one knows better than the participating countries and their people. I believe that the participating countries will bear their own interests in mind to make the choice and decision that can best meet their own development needs. Q: You just said that China will play its role in resolving the Korean Peninsula issue. Could you talk more about China's role? Apart from that, some China experts are worried that China will be sidelined in the settlement of the Korean Peninsula issue. What's your comment? A: Like what I said just now, China has stood for and actively promoted the settlement of the Korean Peninsula issue by all relevant parties through dialogue and consultation and maintained that all relevant parties should enhance understanding and build mutual trust through contact. We always approve of and support the communication and interactions between the DPRK and the ROK during the Pyeongchang Winter Olympic Games and root for them. 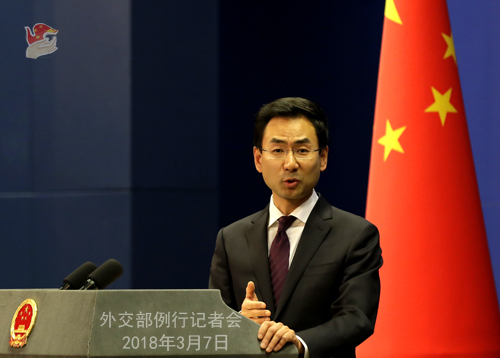 For a long time, China has played a positive and constructive role and made relentless efforts on the Korean Peninsula issue and won widespread approval and acclaim of the international community, so to speak. Going forward, China will work with all relevant parties to continuously move forward the process of denuclearizing the Peninsula and politically resolving the Korean Peninsula issue. Q: Recently, when making comments on the Korean Peninsula issue, the Foreign Ministry seldom mentioned the Six-Party Talks. Does it mean that China no longer stands for the Six-Party Talks? A: To call for the early resumption of the Six-Party Talks is the clear-cut requirement of the DPRK-related resolutions adopted by the UN Security Council. It reflects the consensus and shared aspiration of the international community. In view of this, the international community should make concerted efforts to promote the early resumption of the Six-Party Talks. 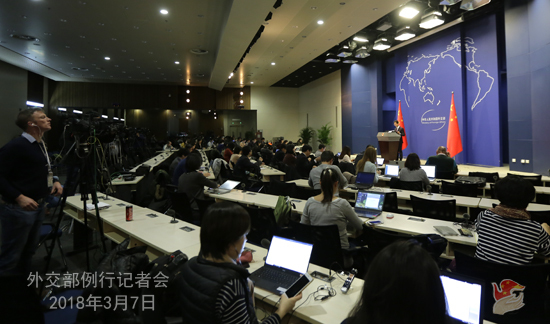 The press center for the first session of the 13th National People's Congress (NPC) will invite Foreign Minister Wang Yi to hold a press conference on China's foreign policy and foreign relations at Multi-functional Conference Hall, Media Center at 10:00 am on March 8. We welcome your attendance. The regular press conference of the Ministry of Foreign Affairs will be adjourned on March 8 and resumed on March 9 (Friday).